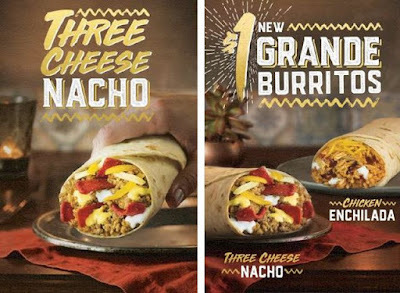 Taco Bell explores more $1 value options with a test of new $1 Grande Burritos in Birmingham, Alabama starting December 21, 2017. The new burritos come in two varieties: Chicken Enchilada and Three Cheese Nacho. The $1 Chicken Enchilada Grande Burrito features seasoned rice, shredded chicken, red sauce, cheddar cheese, and reduced-fat sour cream wrapped up in a warm flour tortilla. The $1 Three Cheese Nacho Grande Burrito consists of seasoned beef, nacho cheese, red strips, three-cheese blend and reduced-fat sour cream in a warm flour tortilla. The idea seems to be to stuff some of their regular menu items (namely enchiladas and nachos) into a burrito and offer it for a low price. The burritos will go for $1 each or as part of a $5 Box along with a Doritos Locos Taco, crunchy taco, chips and nacho cheese, and medium fountain drink. The test will run through January 24, 2018.